Principles of true engagement in middle school ELA: You’ll learn actionable principles to help you in supporting students to meet key developmental needs and become confident, active learners. Empower students to become critical thinkers: Learn strategies for supporting and encouraging a culture of original thinking in your classroom. Reporting and Gradebook: Navigating through the Gradebook and Reporting tools to find and assess student work. 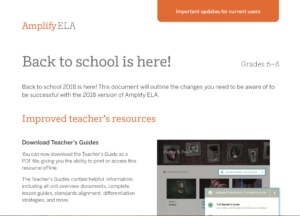 Assessments: The where, when, and how of assessments in Amplify ELA. From Start to Finish: Watch a veteran instructor model lesson navigation, review planning techniques, and walkthrough a lesson from start to finish. Differentiation strategies: Learn differentiation strategies that drive learning and maximize growth for students of all levels. Feedback strategies: Learn how to provide timely and effective feedback that is actionable and helps develop student strengths. At Amplify, we are always listening to teachers that use our products. In response to your feedback, we are proud to announce several user-experience improvements. Check them out by clicking the image below. For more information about these Reading Assessments, check out the Unit Reading Assessments Guide. And, keep an eye out for information about Reporting for unit reading assessments, available by the end of the year. We are pleased to bring you information about an exciting new feature available now in Amplify ELA! The new automatic writing evaluation tool (AWE) will automatically provide scores for the foundational skills of Focus and Conventions, allowing you to prioritize scoring Use of Evidence. AWE scores appear in Gradebook and you can always override them with your own Focus and Conventions scores if you'd like. For more information about how AWE works, check out the detailed document on the Tutorials page with images from the tool. We are excited to share that a new screencast to explain ELD 6 Lesson Cycle has been created to help you understand how to plan, teach, and customize the ELD lessons to meet your students’ needs. Gradebook screencast will guide you through all the features of Gradebook and how to effectively use Gradebook to view student work, provide feedback and assess progress. Myth World Quest screencast was also added to help guide you through the set up, materials, and planning, and it will provide details on how to run this Quest in your classroom. Keep your eye out for more screencasts that will be added soon!